Are you looking for a way to beat the bookies and start to earn some real profit? Then look no further. Buy with complete confidence, over 200+ templates sold worldwide with excellent feedback and customer reviews. Continued support to help with any questions or problems you might have. This is a fully automated football results, fixtures, statistics and prediction spreadsheet. All updated at a click of a button using the custom ribbon. There is no manual input involved in updating this spreadsheet as all the information is downloaded from the internet in seconds and at a click of a button, all the hard work is done for you. All you need to do is select your leagues and use the statistics and predictions to help you make informed bets. Your bet is just a guess without using historical data. Please don’t be fooled with the other substandard football template on sale on eBay. They all require manual input and are very basic, by the best forget the rest. This file is truly unique, and you will not find another template that covers all these leagues and is fully updated at a click of a button on eBay. With over 100+ statistics, 100+ predictions, unique accumulators and tips / picks, think of this as a one-off investment. As a bonus feature I have added in a cryptocurrency button. Have you ever wanted to get into trading cryptocurrency? I have added some links into the template to help you get started. Contained within the workbook you will find historical football data on 38 leagues over 27 countries from 2005/06 to present (2018/19). You have statistics on team performances, head-two-head matches, predicted results (including True Odds*) and tips like NAP, NB, Treble, Lucky 15, Accumulator Best Bet and Under/Over Goals, Cards, Corners and a compound betting strategy. 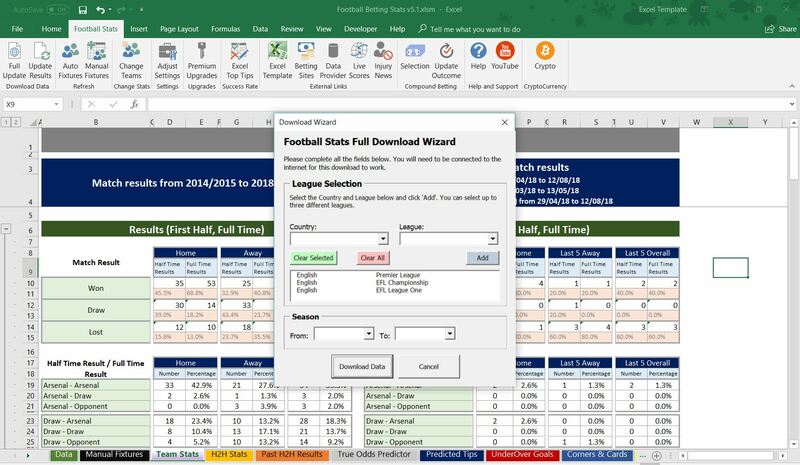 As default you have the option to download and analyse up to 3 leagues at once with the option to increase this to 10 within the template. 1) Data - Contains the historical football data download from the data provide. This provider is very reliable with updating the results and fixtures. 2) Team Stats – Changeable team statistics on a user selected team. Stats are summarised from the Data tab and grouped by a theme. You will have statistics on the last 5 team matches at Home, Away and both. 3) H2H - Head to Head Statistics on two selected teams of your choice. 4) Past H2H Results - Selection of the most commonly used stats to show you the number of times they have turned true for each of the current fixtures downloaded. 5) True Odds Predictor - A large selection (25 different predictions) of predicted results and their true odds, probability and value. This is also home to the unique Accumulator Best Predicted Bet. If you decide to upgrade you can also get the same predictions for half time results, providing some great value. 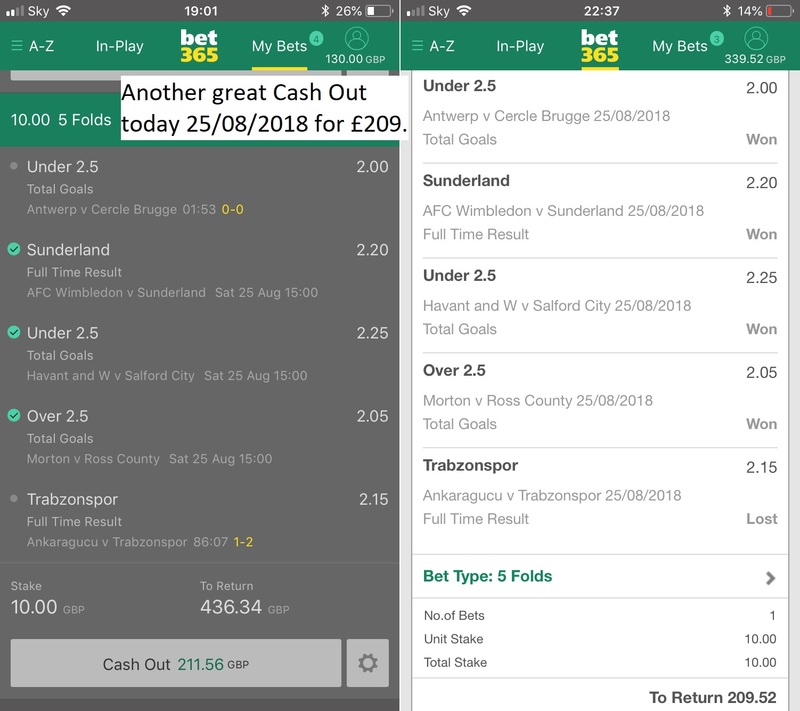 6) Predicted Tips – This is where you will find the NAP, Next Best, Treble bets, two Lucky15 on Match Results, BTTS and Best Value, Up to a 5-fold accumulator returning great odds, Under/Over 2.5 goal full time accumulator and a Under 1.5 and Over 0.5 half time goals accumulator. 7) Under/Over Goals - Percentage probability for Under/Over 1.5, 2.5 & 3.5 Full Time Goals. Also if unlocked Over/Under 0.5, 1.5 & 2.5 Half Time Goals. Summarised is also the score line / results for the last 5 Home and Away team matches. 8) Corner & Cards - Percentage probability for Under, Exactly or Over a given number of Corners or Cards in a match. 9) Double Up Bets - Bets with a 60% or more probability and with odds of over 1.9. Showing some really value. 10) Compound Betting – My long-term (season long) betting strategy. Choose 1 bet from 5 options and it will keep track of your profit. 11) Predictions Success Rate - A dedicated tab to record all your predicted tips from the predicted tips tab so you can monitor their success rate and adjust if required. 12) Manual Fixtures - You can now enter your own fixtures using the manual option within the template. This template comes with a complete user guide to help with any questions and help you to understand how to use the template. *True odds is a calculated odds for each fixture compared against the book makers to find the best value. This workbook relies on a third party for the supply of data.